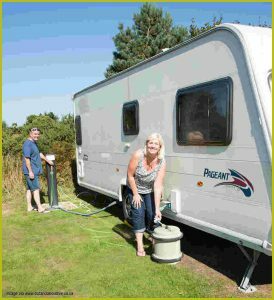 Most caravanners will recognise the submersible pump that sits inside an external water container, like an Aquaroll and pump the water on board. They use a small 12-volt motor to drive the water through a pipe and into your caravan. Traditionally, water pumps would be turned on and off by a switch built into each tap. Alternatively, pressure switching can be used – when turning a tap off, the pressure rises, causing the switch to operate and turn the pump off. Heating water in a touring caravan can be done using mains electricity of LPG, or sometimes both. Water heaters sometimes heat water alone, but combination units are available which also provide space heating. Common heater brands include Truma, Whale and Alde. You’ll need to sterilise your water system to make sure the water you’ll be using is safe, and to ensure grease and deposits are reduced. Close all the taps and valves. Add a cleaning agent to your fresh water tank, then fill with water. Turn on taps starting with the one furthest away from your water tank. As the water runs through you’ll start to smell the cleaning solution. When this happens, turn off the taps and leave for up to 12 hours to properly sterilise the pipes. After 12 hours turn on the water again to run fresh water into the grey water (used water) tank. Repeat this step until you can no longer smell the cleaning fluid. Empty the grey water tank. You may also want to change your filters. It’s also worthwhile cleaning your Aquaroll to ensure it lasts as long as possible. To do this, add 4tbsp of bicarbonate of soda and fill with water. After gently rolling it on its side, leave for 24 hours before rinsing thoroughly. Pour 300ml of specialist cleaner to the toilet cassette, adding 5 litres of lukewarm water. Shake the tank back and forth several times then leave for at least 16 hours then empty.